Newton Aycliffe won their first Northern League game in eight under Colin Stromsoy last weekend – but the new manager insists he’s “no Dumbledore”. The former Team Northumbria boss was appointed head coach by chairman Allan Oliver after a disastrous run of games which culminated in the departure of Deano Browne last month. Stromsoy worked his magic in his first game as Aycliffe won 1-0 at derby rivals West Auckland last Saturday – lifting the Blues up to 12th in the table. And the Newtonians are hoping to build on that with the visit of Sunderland RCA to Moore Lane Park this weekend. “We put some structure in and we put a game plan together which was very much about frustration,” Stromsoy told Aycliffe Today. “But I’m no Dumbledore! It was just about making it difficult for them, to counter-attack and work the set-plays, and that’s what we did. “It was a great start, but one sunny day doesn’t make a summer. We’ve got a big game against RCA on Saturday, and we haven’t had a good record at home. 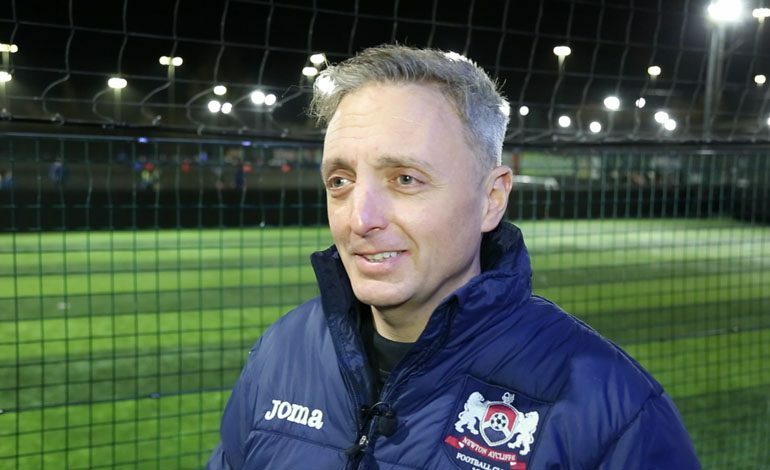 Stromsoy – who spent seven years as director of sport at Northumbria University and now works as a full-time coach for a national football academy – was drafted in to help Aycliffe secure their first division status for what would be a ninth consecutive season in the top-flight in 2019-20. But he’s already planning for the long-term. He told us: “I didn’t come here just for nine games. There is two parts to it – staying up this season, then what we need to do to be really competitive next year. “I like the feel of the club. I like its ambition and it’s got a great chairman. They’re doing great things off the pitch as well as on it. “Modern-day football, even at non-league level, is all about what happens outside of the game as what it does in the game, and the guys at Aycliffe understand that. “I would always have a team passing and playing football the right sort of way – to do that you need a good pitch, and they’ve put a lot of money into the pitch (at Aycliffe), they’ve created a good environment down there. So what can Aycliffe fans expect from Stromsoy’s side? “We’ll be organised, we’ll be prepared, we’ll be determined and we’ll be disciplined,” he said. “Does that equal wins? No, of course not. But the fans will see a team playing the right way and trying to get points. Aycliffe are at home to Sunderland RCA on Saturday (February 9, 3pm kick-off).